We get power from wind, sun and water. There's another potential power source that's so plentiful that it covers 71% of the Earth, but it's been a struggle to tap. Startup Columbia Power is the latest company to dream of harnessing the ocean for electricity. It's building a wave generator called StingRAY that will float on the ocean's surface, turning each passing wave to usable power. Ocean power isn't a new idea, but it's struggled to find a cost-effective approach. Wave generators can't be dropped in just anywhere. They have to account for things like existing shipping lanes and marine life. The tidal power industry, which relies on the tide to turn giant underwater turbines, is much more established but still far from mainstream. 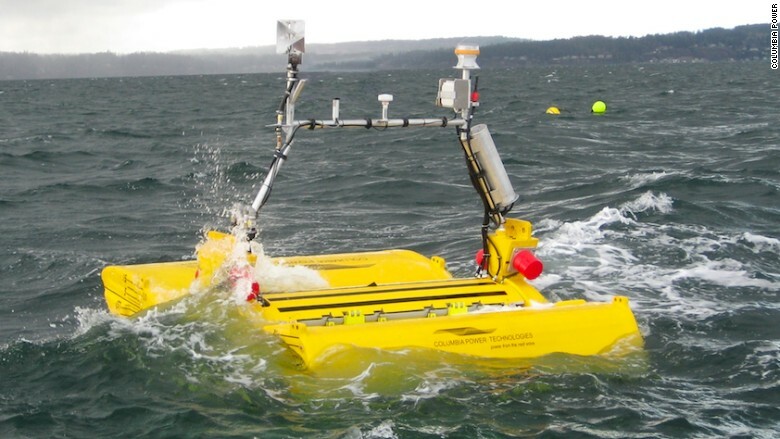 Wave power is a similar but younger technology facing its own unique sets of challenges. Related: Are these chargers the solution to terrible smartphone batteries? Columbia Power is tackling wave power with a system similar to a wind turbine. It's held in place by a mooring attaching it to the sea floor. Each passing wave turns floats inside a central compartment, powering a magnetic generator. A large underwater cable connects a farm of turbines to a power grid. The most recent version of the StingRAY weighs 700 tons and is 20 meters high. The bulk of it is hidden below the water's surface so all that's visible from above is 2.5 meters of bright yellow machinery. At night, navigation lights warn passing boats to their location. And the ocean can be an unforgiving environment. The constant stress of water, salt and rough motion means any equipment needs frequent repairs. Columbia Power's system is designed to be maintained at sea, so it doesn't need to be turned off in heavy storms or dragged into port. There's an advantage to setting up shop at sea versus on land. The StingRAY is designed to work in water 70 meters deep. On the U.S. West Cost, that's about three miles offshore. Far from cities and homes, the farms can avoid angry locals and regulations that plague wind turbines. These behemoths aren't powering anything just yet. The 11-person company is testing its creations in special tanks, like one at the University of Washington. One StingRAY was tested for a little over a year in Puget Sound. Now the company is preparing to deploy a large-scale version at a Navy test site in Hawaii. Columbia Power CEO Reenst Lesemann says it will take a while for wave power to be used by mainstream markets, but it could be useful to smaller markets. An island with scarce resources, for example. Columbia Power is optimistic that wave power will eventually join solar and wind power as a viable alternative power source. "Waves obviously never stop," said Lesemann. "It's a 24/7 resource, it doesn't matter if the sun is shining or not, or if the wind is blowing."